Storage is one of those things that you never seem to have enough of. Just when you think that 2Terabyte drive is going to last you it seems to get full like magic. I can vividly remember buying a 1.2GB drive and thinking that would last me for a very long time. As you might have guessed it did not and the progression only got faster. It was not long before file sizes were getting larger faster than storage makers could keep up, at least in the consumer world. In the professional world we still had large arrays of disks (RAID) to help maintain capacity and performance. Unfortunately, these arrays also had a limit due to the difficulty in expanding them once you reached their capacity. As storage systems evolved this was remedied by adding in more “trays” of disks. The down side here is that these types of systems are very expensive and out of the reach of many (if not most) small and medium sized businesses. In this space the NAS (Network Attached Storage) and not the SAN (Storage Area Network) are the most common products and have the same limitations of direct attached storage. So, what do you do when your NAS runs out of space? 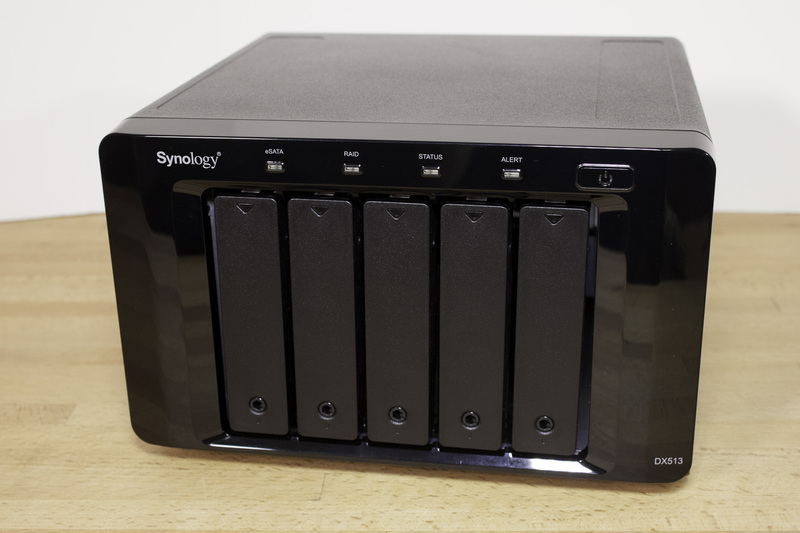 Synology has an answer for you in the DX513. Follow along with us as we show you just how easy and even cost effective this handy add on to the DS1512+ is.